Just a very quick post as to what I wore yesterday and today. Excuse me today because I my hands are extra full. So let the pictures do all the talking. Now this is my treasured picture. 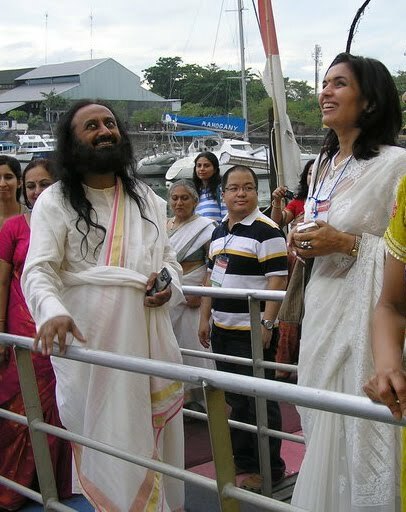 It is my first picture with Guruji in Bali. 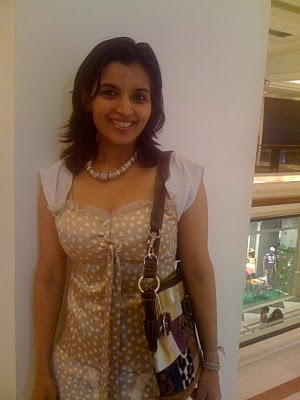 Had worn the same saree then. This is my super treasured picture. It is also the wallpaper of my laptop. Whenever, I look at it, Guruji is right there with me. HIS eyes talk. Can you see how ecstatic I am to be shot next to HIM? Bliss to be sitting near his feet. These are few more of my Bali pictures. And a few at home. I am in Saree mode these days. It is my niece's wedding functions for good 7-8 days. Yesterday was Mehendi. Yours Truly is working round the clock. Somehow managing the work front during the day time, functions, home and family front, blogging, own workout, meditation, blahhhh...I am super woman for sure. Barely getting few hours of sleep. Missing my time with my girlfriends. I need my dose of some peaceful time with Guruji, some quality time with my boys, more gossip with my sis on phone and chirpy stories of my (almost) two year old nephew, who, now talks full sentences. Pure Zari Kota Saree: Designer Ragini Singhania. The small mirror you see behind me has a history/story. It is my darling grandmother's mirror. I have it as her memory. It has inlay work of ivory. Now I must re emphasis, how our traditional weaves totally stand out. So many people there (not even known to me- groom's relatives etc) came to me specially and told me, that my sarees totally stand out. They are class apart. Yes, I agree. Do you? Color white (and Fuschia) are my all time favorite in Saree (I don't have to say it again and again). And if you have been reading my previous posts, you exactly know what kind of sarees I fall for. But what I am going to tell in this post is something more. In traditional weaves, my top most favorite (like really really favorite- to die for, irresistible) is Chanderi Saree. Now I must tell you that this hand woven traditional saree is not very easily available and not many people are as crazy about it as I am. When I go hunting for these, 99% shopkeepers do not have it. You know why? Because they do not get huge profit margins on these as they get selling cheap embroidery stuff. But Chanderi Sarees are exquisite. They are like a dream. And they are bloody expensive. They look simple but they can cost you a bomb. So only very discerning few would go for it. Only the ones who have a taste for it. So I sometimes travel to Chanderi specially and get some breath taking sarees all the way from there to add to my collection. You could say, I am addicted to them. With the love of my Life- Divine Grace- The Supreme Power Himself. Yesterday there was another Pooja in the family, where I wore the same. Here are few of those pictures. 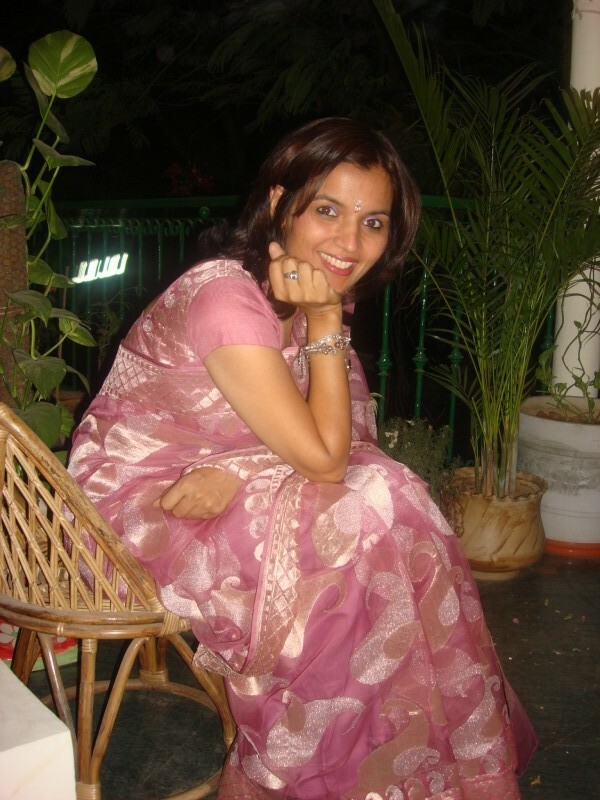 Following are few of my other pictures again in my favorite Chanderi Saree. These were again taken during my visit to the Bangalore Ashram of Art of Living. It is my second home. It is so magnificent- ethereal beauty. There I do not carry a leather bag. But a simple cloth bag. Yes this Saturday and Sunday both, I am working (sob sob- No off on weekend too). Today there was loads to finish on the work front, home front and attend a family function too. My day started as early as 5 AM. I did my own workout and went for a very enjoyable bike ride with a very sweet client. I definitely think she is sweet because she is so positive and chirpy. She rides a horse and does dressarge. One of these days, I do intend to take a lesson or two from her on riding. She tells me, it is a great workout. Evening, I had to attend a family do (Hawan). I have mentioned earlier, how I dress differently with family, with friends, for going to Satsang in Art of Living, in my workplace, etc etc. Yes, this is more traditional side of me. Jewellery: No prizes for guessing- Bought from my dad. Pure Zari Kota Saree: Dastkar Exhibition ( It is the best place to buy beautiful weaves that fascinate me so much). Sometimes (these days very rarely), I like to stitch and create something. Yes, I can stitch and embroider too. Life is so busy these days, that I hardly ever get any time to do it though. So very quickly I am sharing one of my own creation. Entirely, purely mine- Design, execution and of course modeling of the outfit too. This dress has a very interesting back, which, unfortunately has not been captured. Location: Garden of Five Senses, Delhi. Unlike me, my mom is staunch believer/user of home made, kitchen recipes/concoctions for everyday ailments. While I would use La Mer face packs and scrubs, she is happy with her papaya, cucumber, tomato face pack, her home made rose water etc. And I must admit she glows. She certainly does not look her age. She still does not color her hair with Loreal but prefers henna. She has a home made remedy for everything- to beat the heat, for cold and cough etc etc. Gond katira is the resin extracted from a particular tree. It is soaked in water overnight. Next morning it expands a lot. So you have a bowl full. It is best to beat the summer heat, to get rid of bleeding nose, prickly heat etc. I have seen, it also helps in weight loss. It is consumed with ice cold lassi or milk the next morning. Mom also serves it with Rooh af za. It is also served with matka kulfi. I particularly like this dress in summer because of its color and cool cotton fabric. This is how I look after I have worked for 14 hours a day straight. Exhausted, but I can smile for the camera. Besides, I can also go for a short drive. The winner of this Giveaway is- Jyothsna. She is a lovely mom and has a great blog here. 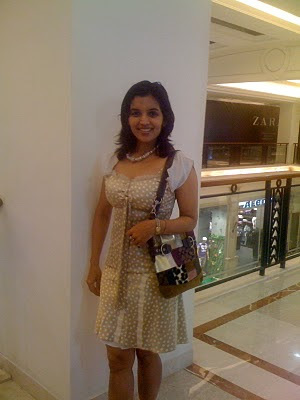 Jyothsna I hope you like this dress as much as I do. Lots of Love. Do check this blog. I had featured the prettiest bride in my earlier blog post here. Sovina has done such a fabulous post about this same bride. Do check her blog here. Last few hours left for you to win a dress as a Giveaway being offered. Read the previous post here for details. It seems to be another heavily busy day. So for the outfit of the day, I thought of posting my workout clothes, in which I shall be for most of my day. See my very boring (at least thats how I feel), workout clothes. Am I the only one who finds workout clothes so boring? Few options we have is Adidas, Nike, Reebok, puma, etc. Canada, we have lululemon. Or we have options like Juicy couture. Still not much. Which is your favorite brand of workout clothes? Have you discovered something really stylish? Share your views please. Shoes: Tommy Hilfiger- Yes when I am myself not working out (its just the clients) and specially when it is low impact workout, I prefer not to wear my regular workout shoes but shoes like these. They are comfortable, easy to wear and stylish. I saw This beautiful Interior that I really wanted to share on this blog. Isn't it so pretty? It is light on a ceiling. 24 hours left. Here is your chance to win this dress. For your chance to win a dress, simply be a follower on google and leave a comment on any blog post along with a way for me to contact you. 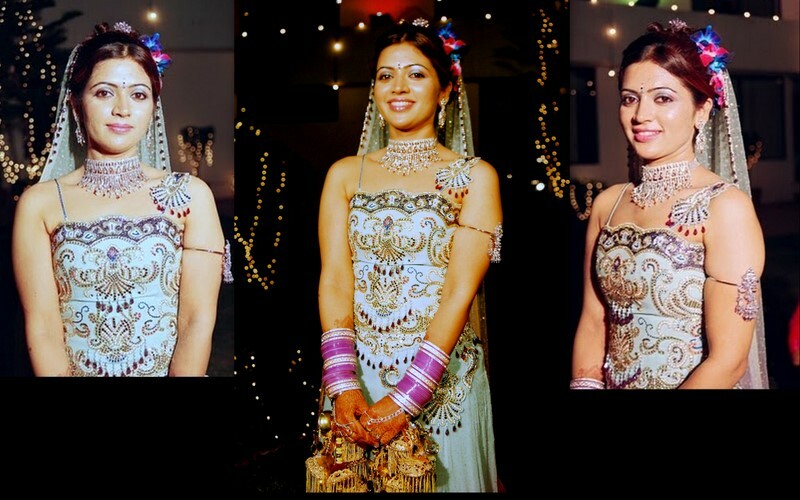 In my earlier blog post here, I had shown a a dress, that I got customized tailored. This dress will be awarded to the winner, who will be chosen at random tomorrow at midnight Indian Standard Time and will be announced on this blog. This giveaway is open to everyone, worldwide. It has been one very busy day. Lots of trainings, E- trainings, few new corporate trainings, new client meeting. Work does exhaust me but it is fulfilling too. It brings in a sense of achievement to see my clients transforming, shaping, getting fitter, better, healthier, happy and smiling. And family time has to be squeezed in. Daily chit chat with son, husband, mom/dad, sister, is must. Over the dinner, my friend pointed that I really like dressing up. I should say- yes. Specially because, in my work (in the field of fitness), I am always very casual- Track pants, T- shirts, (barely any make up- except a dash of perfume or deo). So yes, when I go out, I do like to dress very well. I enjoy doing all the feminine stuff. At times, like these (like a busy day like today), I quickly dig into my old pics to post very quickly my "outfit of the day" post.